Edmonton is the capital city of Alberta and the fourth city in Canada to approve a Complete Streets policy. In May 2013, Edmonton City Council adopted a Complete Streets Policy statement and Complete Streets Guidelines. This made Edmonton the fourth city in Canada to approve a Complete Streets policy. The Guidelines are a standalone, dedicated document, and include an extensive toolkit to guide Complete Streets transformations in Alberta’s capital city. It contains specific sections for accommodating pedestrians, cyclists, transit and goods movement. Read our post about Edmonton’s 2013 policy and guidelines. 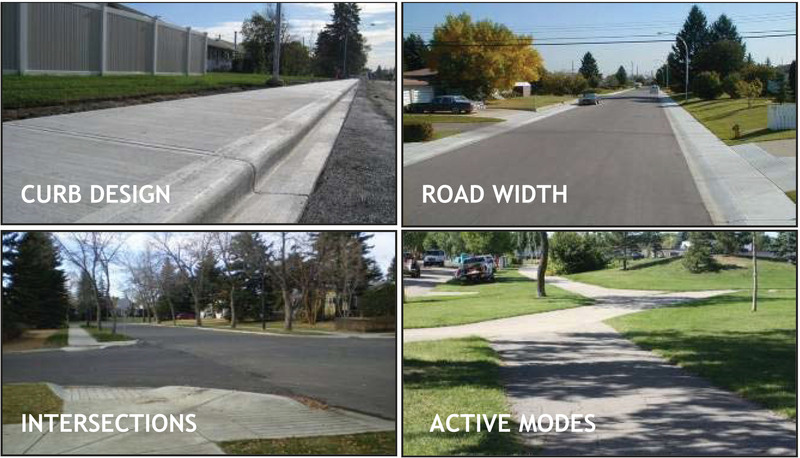 In June 2018, Edmonton released Complete Streets Design and Construction Standards which integrates their previous Complete Streets Guidelines and Volume 2 Roadway Design Standards. Read more on Edmonton’s website. Westmount is the first neighbourhood renewal project to incorporate a Complete Streets pilot project. The pilot project follows Complete Streets design principles, using a Cost Efficiency Analysis of the area. Highlighting safety, environmental and social factors, the Cost Efficiency Analysis aims to showcase the effects of implementing Complete Street designs for the City. Evidence found throughout the Cost Efficiency Analysis will allow the city to improve upon and eventually enforce Complete Streets Guidelines within all greenfield proposals and large scale redevelopments. See details for the Westmount project history. Construction is expected to be completed in 2018. The features of the Westmount Complete Streets Pilot area are described below. 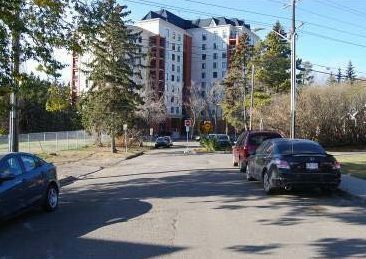 127 Street Collector Plan (118 Avenue to Stony Plain Road) currently includes a one-way northbound travel lane, parking on the east side, and a one-way southbound bicycle lane. 127 Street has been a popular bike route for over 30 years, well used by residents to access the many parks, schools and businesses along 124 Street. Public consultation for the 127 Street corridor will occur under a separate process, incorporating Westmount and Inglewood neighbourhoods. Traffic calming north of 107 Avenue; 122 Street and 123 Street. Currently both streets have chicanes installed from 107 Ave to 108 Ave. Issues highlighted include speeding and cut-through traffic. Response: Alternate chicane design, add drainage, and improve emergency access. 121 Street to 124 Street between Stony Plain Road and 106 Avenue. This section holds a mixture of land uses, ranging from mid-density housing to commercial buildings. There are wide roads throughout the area, with issues including speeding, cut-through traffic, and lengthy pedestrian crossing distances. Response: Increase boulevard space, reduce road widths, provide curb extensions, add bike lanes and sidewalks. Jasper Avenue and 125 Street. Currently Jasper Avenue west of 124 Street and 125 Street south of 102 Avenue operates as two short links of traffic. Issues highlighted, lack of sidewalk connectivity and parking. Response: Add sidewalks and parking, eliminate the confusing space on the west side of the angle parking, clearly define existing accesses.